Who doesn’t love an easy, quick to make, healthy meal? Me, I love pasta, mostly for its versatility. 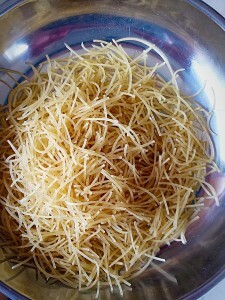 Since any number of sauces or meals can be made to go with a million varieties of pasta. Where would we be without it? And thank you Italy, you may have invaded Britain, however it’s time to let things go, as you gave us pasta. 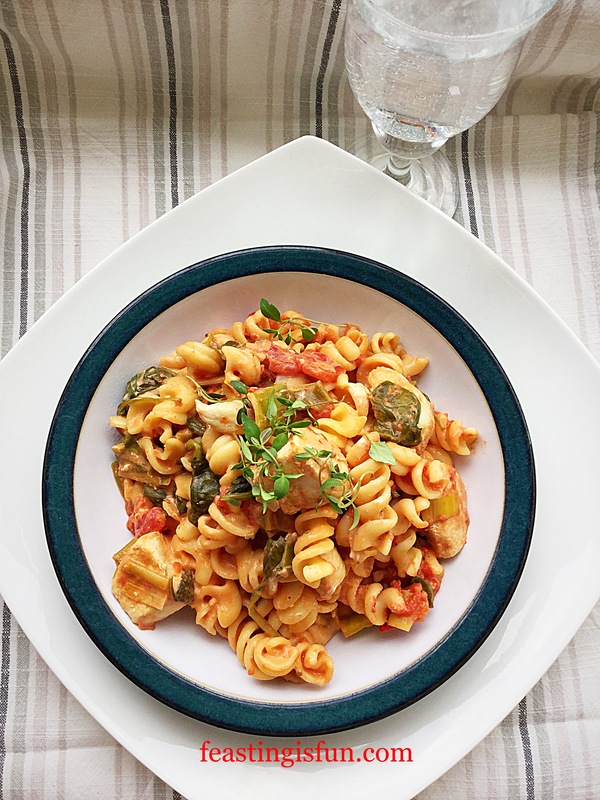 More specifically the fusilli bronze die pasta used in this Creamy Tomato Spinach Chicken Pasta. Next time you think of tossing a jar of pesto into pasta for dinner, think again. Since this dish only took 30 minutes to make, it is definitely worth trying. Not only do you get a balanced healthy meal, it is filling, like a proper meal should be. Bite sized pieces of chicken breast, fresh baby spinach wilted into the tomato and cream cheese sauce. If you are cutting down on carbs you may not like my next suggestion. That is, to serve this tasty bowl of goodness with a chunk of baguette, or crusty bread. While not swimming in sauce, there will be some pooled on your plate or bowl. This is where bread is important. Dunking. While using the bread to absorb every last drop of this creamy sauce. Keeping with the low fat theme, there is no reason why the bread should be buttered. In fact there will be a greater absorbency area if left unbuttered. Win win! 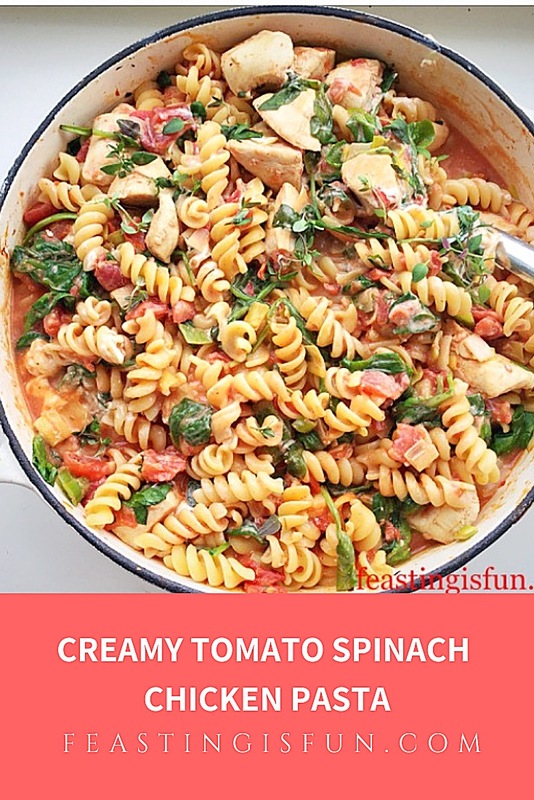 Creamy Tomato Spinach Chicken Pasta dinner time! Food should be enjoyed. Indeed it should be a feast. It should feed more than our tummies, it should feed our soul. Giving thanks before eating is a custom here at home. Yet stopping for a moment to look and smell the food in front of you is also important. Too much food is literally shoved down throats while watching television. I wonder if the taste even has time to register with the brain. Eating with family, while sitting up at a table, not only slows down the rate at which we eat, the entire experience is altogether more pleasurable. Hence – food tastes better when it is shared. Time to make this delicious dish. Place a heavy bottomed pan on to the hob over medium heat. Add the olive oil and allow to heat. At the same time place a large pan of water on a high heat, ready to cook the pasta. When the water is boiling add a teaspoon of sea salt and then the pasta and cook for 8 minutes. Into the other pan add the chopped chicken breast and cook until lightly browned. 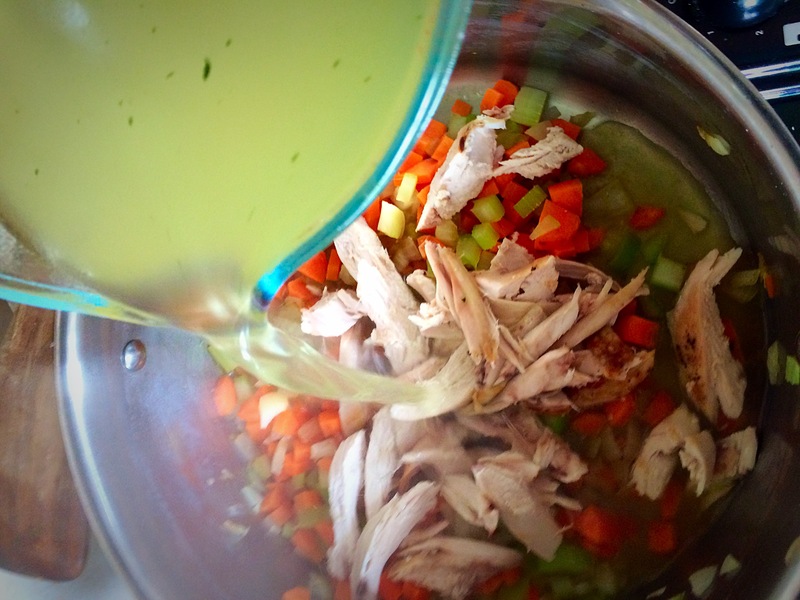 Remove the cooked chicken to a plate and then add the chopped leek to the pan. Saute the leek until it is softened and then add the cooked chicken back to the pan. Immediately add the 2 tins of chopped tomatoes and use a wooden spatula to scrape the base of the pan clean. Follow by adding the chopped fresh thyme. Next tip the baby spinach into the pan. Don’t worry if it is piled high it will wilt down. 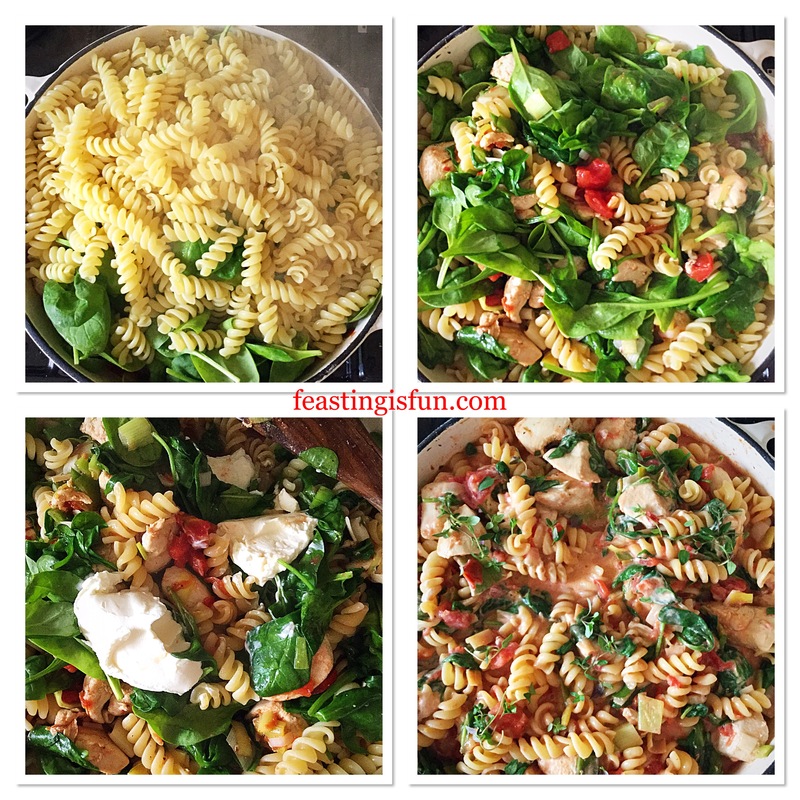 Creamy Tomato Spinach Chicken Pasta the tomatoes clean the base of the pan. Remove a can full/2-3 ladles of hot pasta water and pour on to the spinach. Be careful as it will be hot. Drain the pasta and tip on to the spinach. Allow the spinach to wilt down, it will release it’s water and make the sauce thinner. Next add the cream cheese to the pan and stir so that it melts into the sauce. Most importantly, taste the sauce. Add a good grinding of fresh black pepper to taste. Additional salt should not be needed as the pasta water used is salty. Sprinkle over fresh Thyme and the dish is ready to be served. 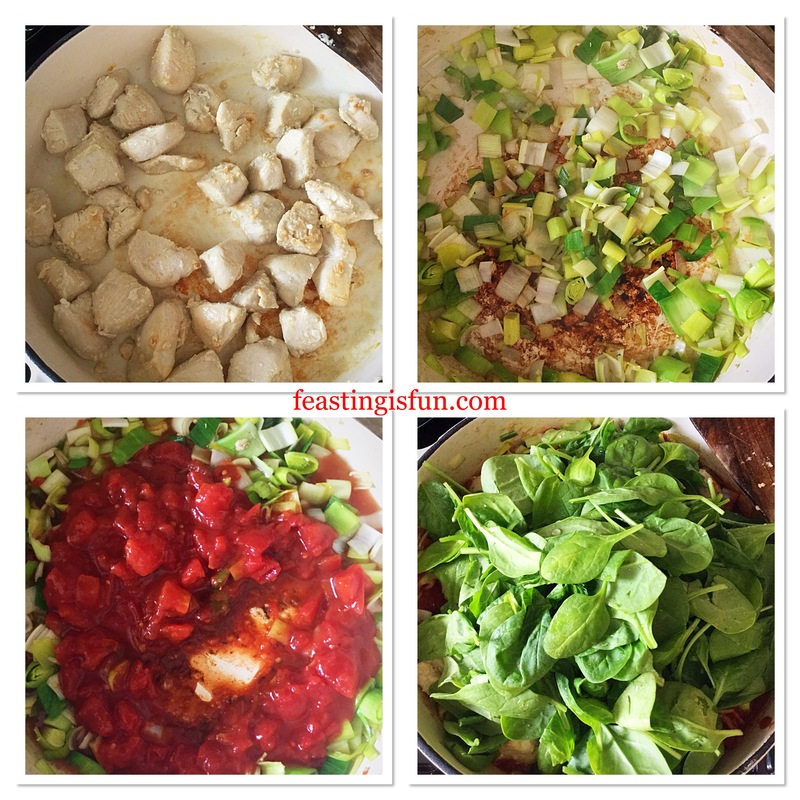 Creamy Tomato Spinach Chicken Pasta creating the finished dish. 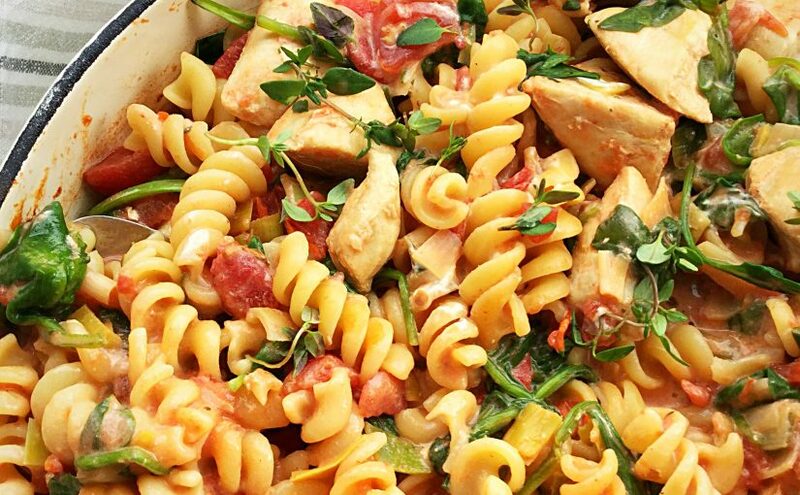 Serve this delicious Creamy Tomato Spinach Chicken Pasta in bowls. 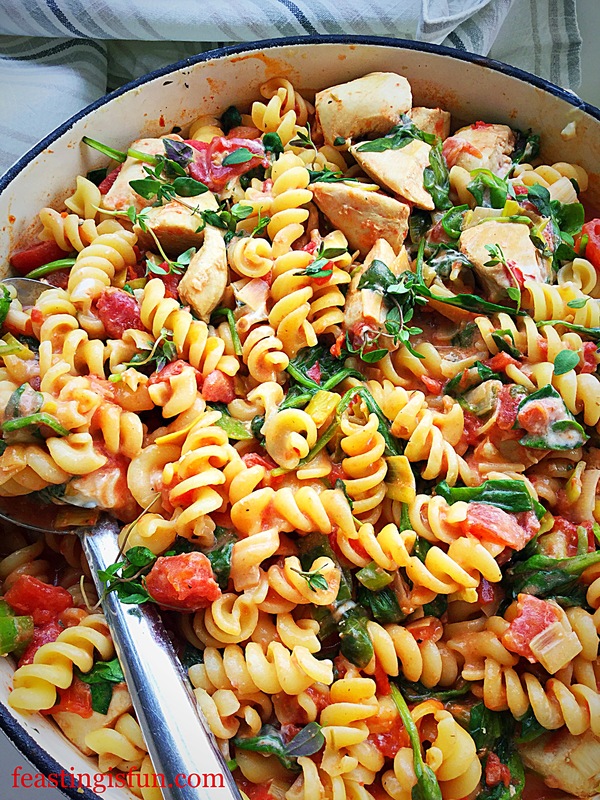 Creamy Tomato Spinach Chicken Pasta dinner’s served. 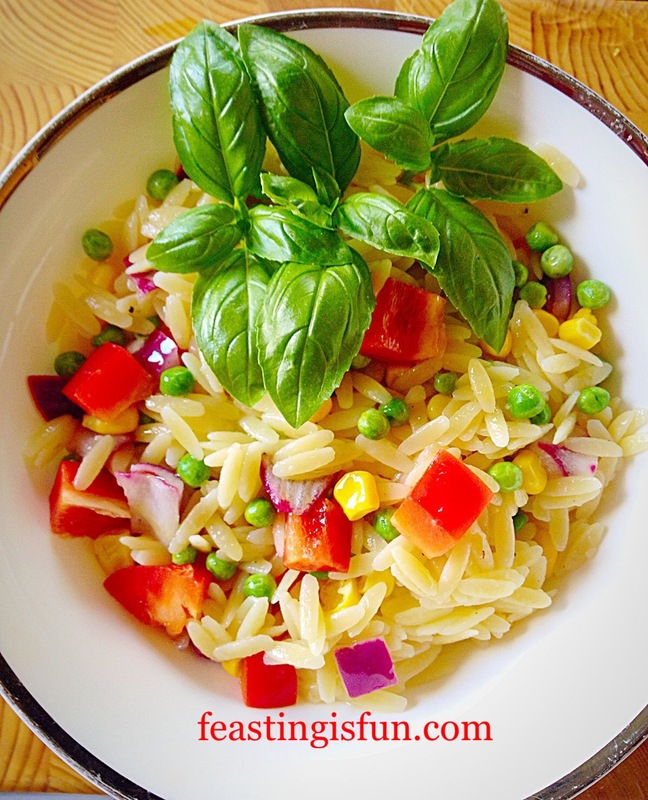 Since this dish is ideal to make ahead, it is also perfect for transporting. Ideal for a new family or friend who is unwell. 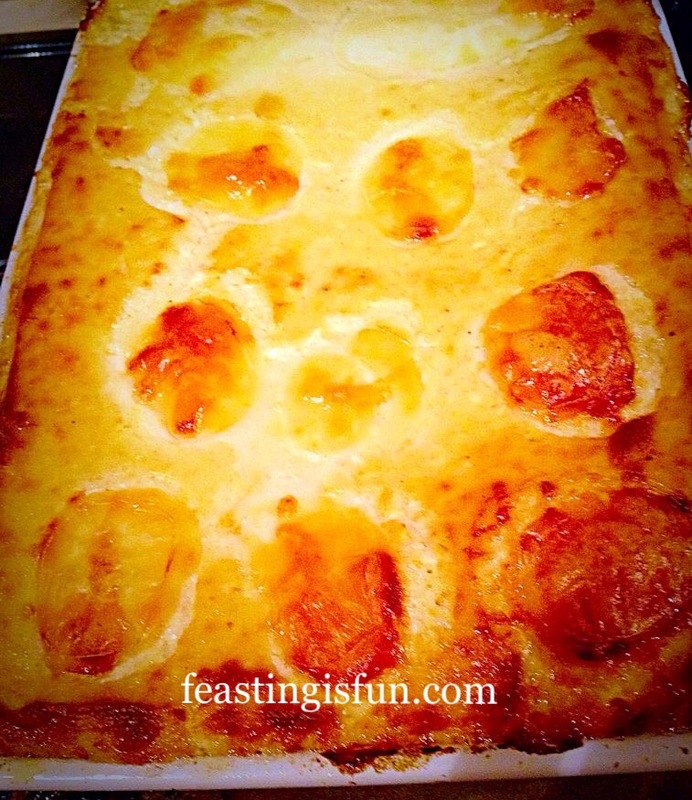 Also this dish is as perfect to share outside the home as it is with family and friends around the dinner table. Pasta is such a versatile ingredient in the kitchen. 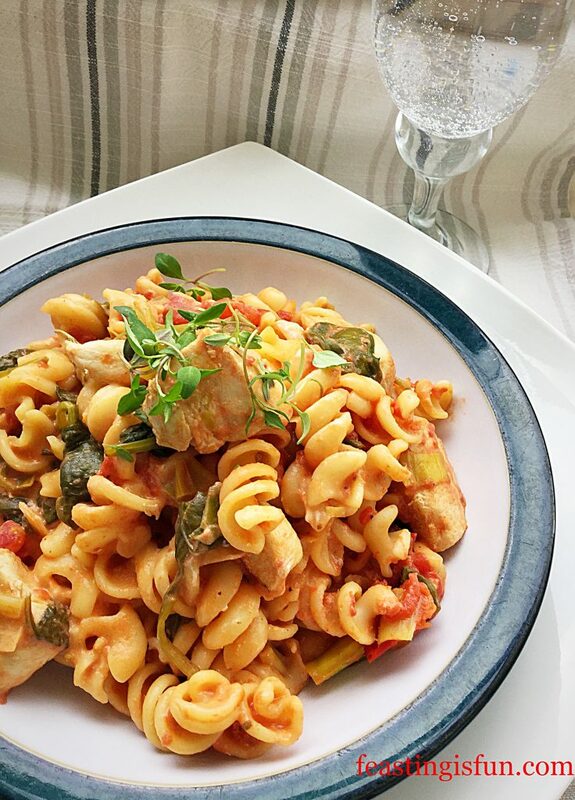 Also, once cooked it can very often be frozen as this Creamy Tomato Spinach Chicken Pasta, Chicken Four Cheese Pasta and Cheesy Vegetable all can be. While cooking from scratch takes barely more than 10 minutes. 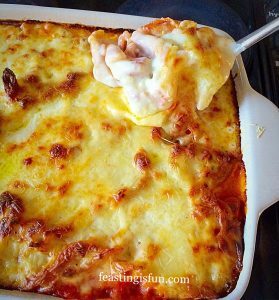 Even though there are countless ready made sauces to buy available, this homemade pasta dishes is quick and easy. And easy meals are a busy household’s must. Have fun creating, cooking and baking in your kitchens. Please do not copy any part of this post. See my Disclosure Policy for full details. 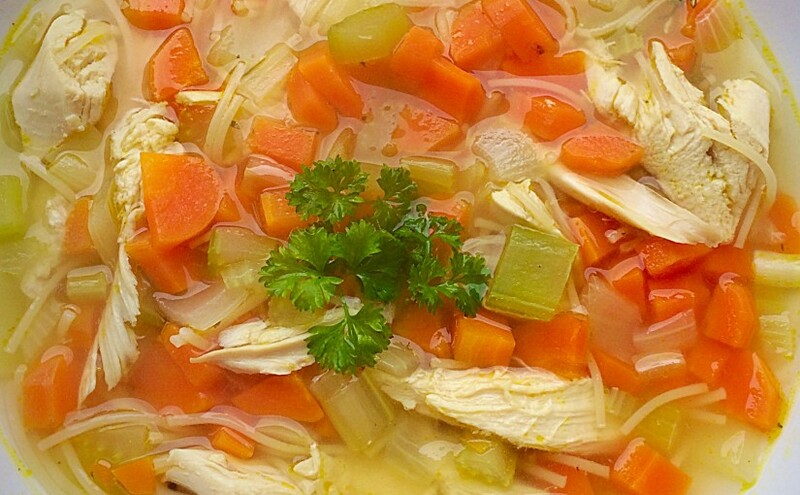 How good does this delicious Roast Chicken Noodle Soup look? And it tastes even better. 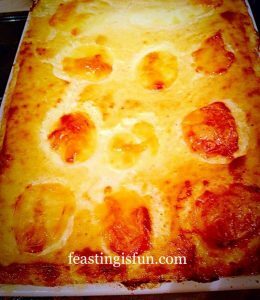 Since it’s not very often I mention the words ‘low calorie’ or ‘low fat’ here, on feastingisfun, yet it would seem, I may have put on a few pounds. And I’m guessing I may not be the only one. Am I right? 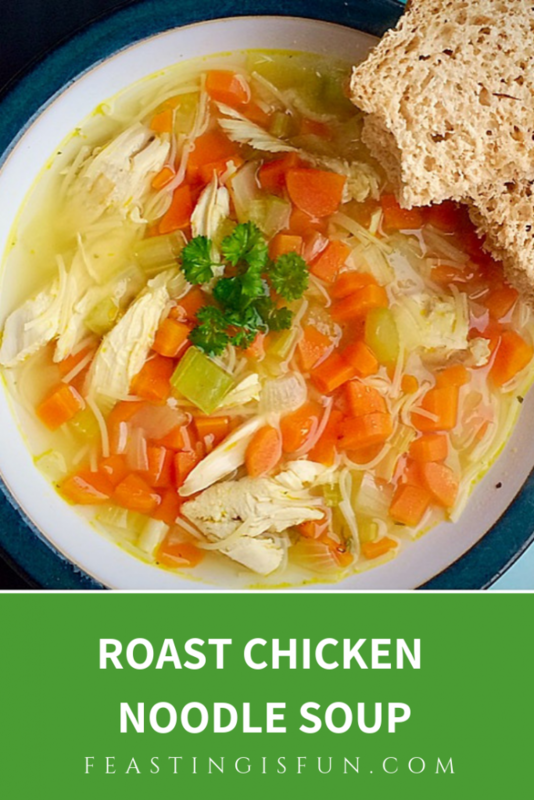 So, I’ve come up with a delicious way to help you save money and keep your weight in check, my Roast Chicken Noodle Soup. 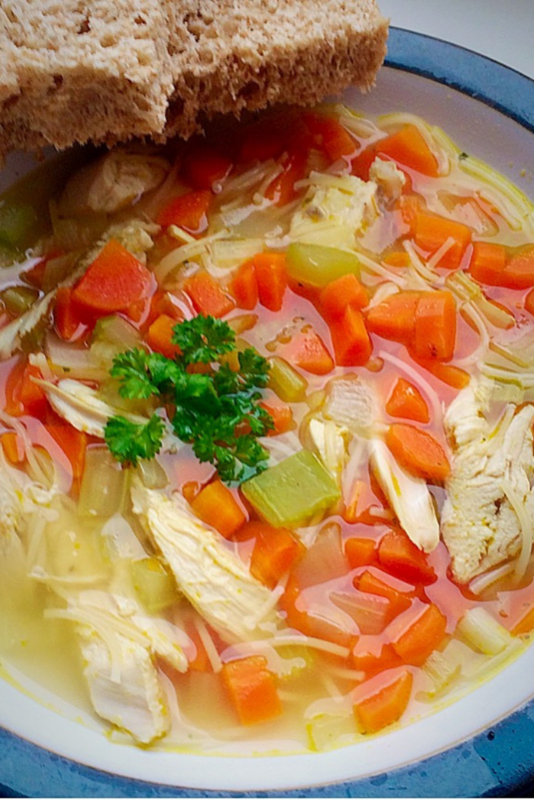 Seriously, one roasted, chicken breast, a few veggies and this soup feeds 4 people. Also it can easily be doubled, if cooking for a crowd, or kept in the fridge, waiting for a quick, thorough re-heat, after a long day at work. I roasted a chicken breast quarter for this recipe, but leftovers from a Sunday roast would work perfectly. Also we are having roast turkey today and I intend to make a batch of this soup with a little of the leftovers, for the week ahead. And did I mention this soup is virtually fat free. One teaspoon of olive oil, to sauté the vegetables, is all the added fat there is. While you could poach the chicken, instead of roasting it. Yet that would rule out leftovers AND all the flavour in this Roast Chicken Noodle Soup comes from roasting the meat, at the start. Since I’m happy to defer to the Barefoot Contessa, Ina Garten in these matters. Because she has been cooking chicken, for her husband Jeffrey, for many, many years and if she says roasting chicken imparts the most flavour, well who am I to argue? 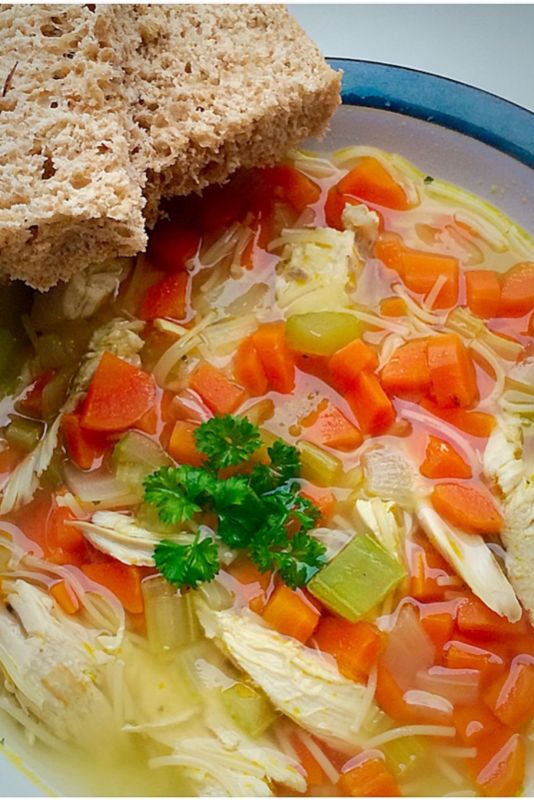 Why The Need For Homemade Soup? Also have a confession to make. Because I have never liked, pre-made, chicken noodle soup. Since it is what is know in our family as ‘headache food!’ And don’t ask me how it got that name, it just did. So, in the interests of clarity, I’m talking packet soups. You know the flat packets that when ripped open reveal powder and dehydrated vegetables. Never liked the chicken noodle one – loved minestrone though! Freshly made Roast Chicken Noodle Soup – not a packet mix in sight! So creating this recipe was a double challenge. Firstly to see if I could make a Roasted Chicken Noodle Soup with very little fat and secondly, to see if I could eat it (without getting a headache) and enjoy it and make it taste way better than the packet soup from my childhood. That’s three things – never mind! Anyway, I totally scored on all points. 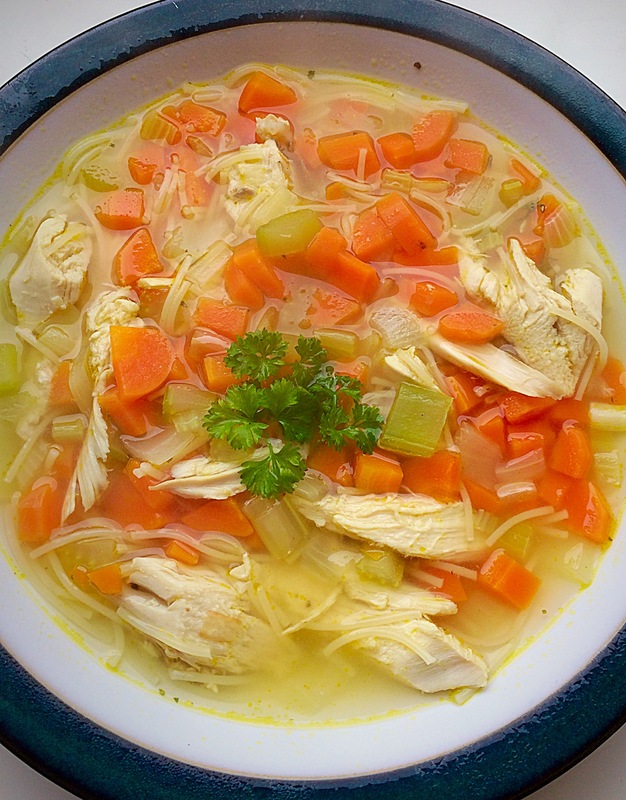 This Roasted Chicken Noodle Soup is delicious, low-fat nutritious and no headache!!!! 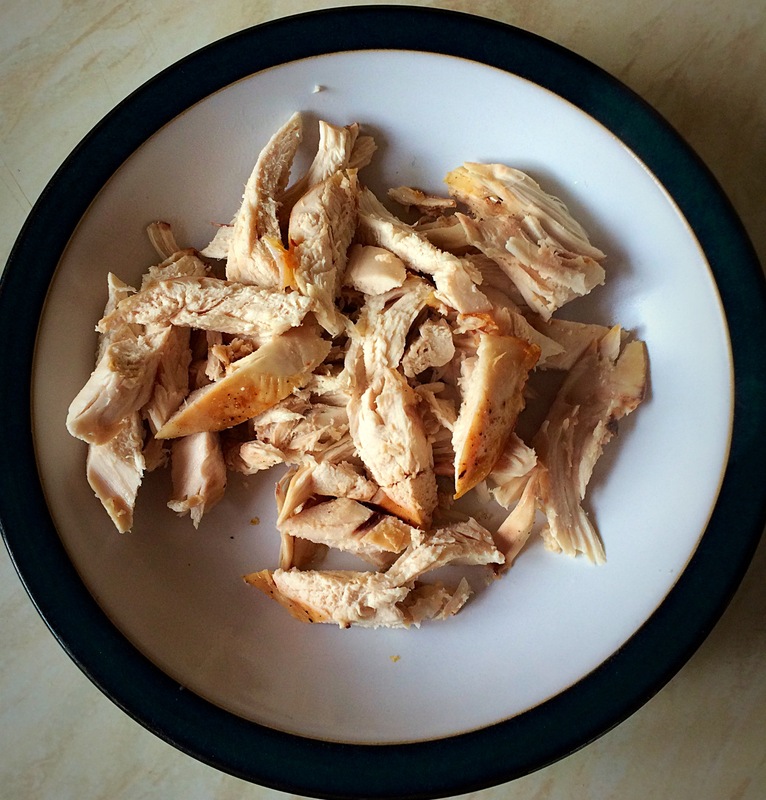 First of all, roast a breast quarter of chicken, at 200C/180C fan, gas mark 6, 400F for 30-40 minutes, until cooked through, if not using leftover roast chicken. One delicious roasted chicken breast quarter. 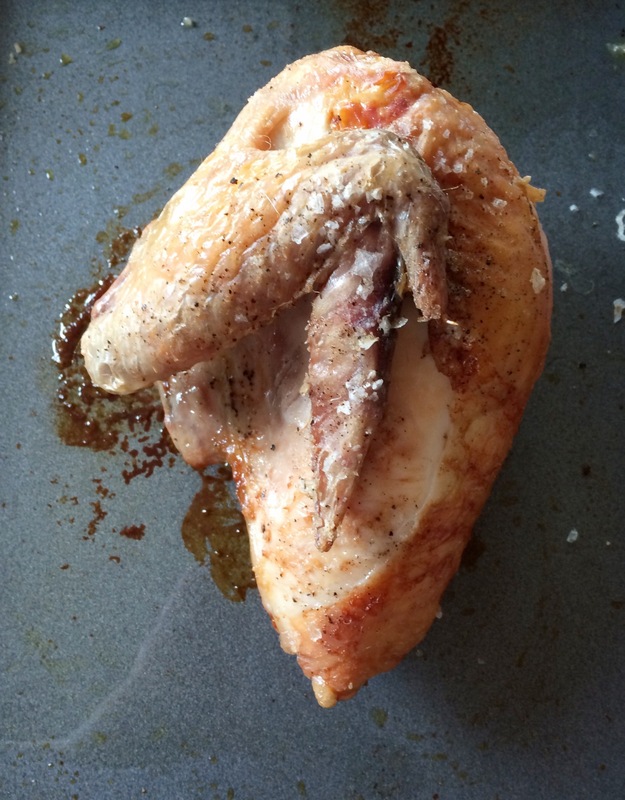 When slightly cooled, remove the skin and shred the chicken, discarding any bone. Alternatively shred approximately 225g/8oz of roast chicken or turkey. Place a large pan, over a medium heat and add the oil. Add the diced onion, carrots and celery to the pan. Saute the vegetables until just softened, approx 7 minutes. Add the shredded chicken and fresh thyme to the pan. Pour over the chicken stock. Weigh out the noodles of your choice. I used broken up vermicelli. Add the noodles to the soup. Taste for seasoning. And add salt and pepper as necessary. Simmer for 5 minutes, or until the noodles are cooked. 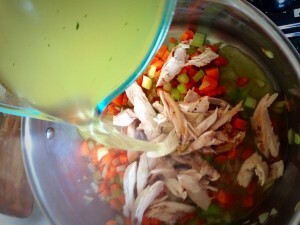 Roast Chicken Noodle Soup add some parsley to garnish and serve. And to make a hearty meal out of this soup serve with some thick, crusty bread like my Wholemeal Cob Loaf or Wholemeal Loaf. Also, if you want to avoid carbs altogether, you could add shredded cabbage, or spirilized courgette (zucchini). 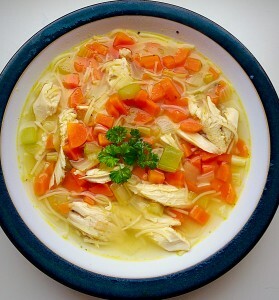 This Roasted Chicken Noodle Soup is absolutely delicious, quick to make, fab for using up leftovers and feeds 4 people for very little. Resulting in a win-win recipe and one that I make frequently. 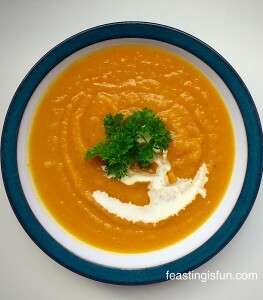 Carrot Soup served with crumbled Stliton cheese. 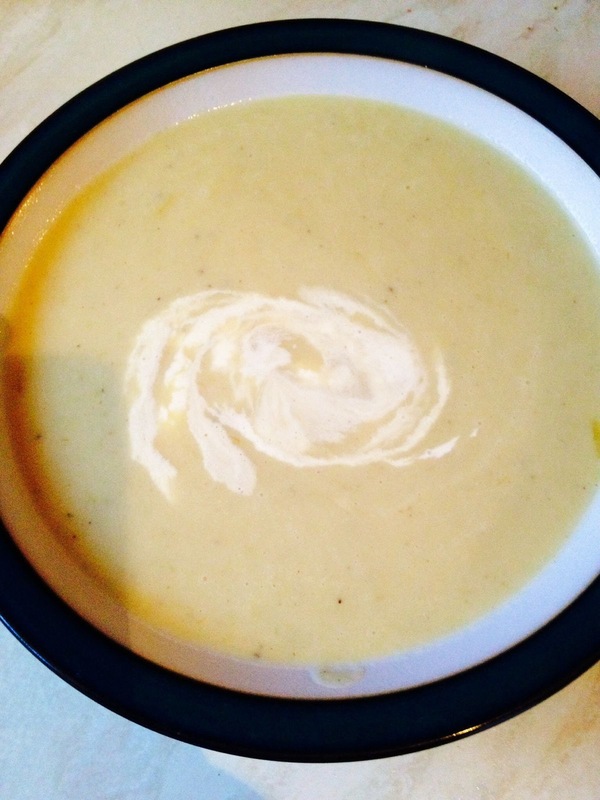 Leek and Potato Soup leave out the cream and you will lower the calories in this delicious soup! Leek and Potato Soup velvety comfort. 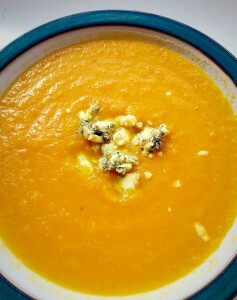 Roasted Garlic Butternut Squash Soup. Roasted Garlic Butternut Squash Soup just add crusty bread! Soup is one of my comfort foods. Whether it’s full of chunky veggies or blitzed to a smooth velvety texture I can always count on a bowlful to make meal feel better. 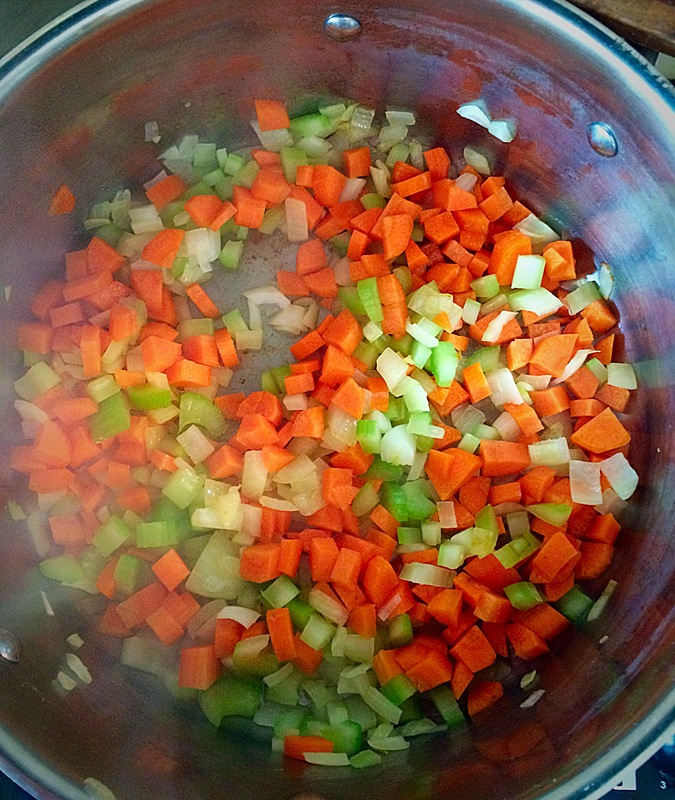 Also if the recipe is quick and easy that simply adds to the pleasure of making soup. Leaving me feeling relaxed and nourished. So whatever you are baking, making and creating in your kitchen, have fun preparing and sharing your feast.